Suffered from Salmonella food poisoning in Portugal? Travellers on Package Holidays to Portugal who are subjected to poor hygiene standards and who suffer gastric illness as a consequence should claim compensation from their tour operator. Food poisoning and gastric illness is preventable provided European food hygiene practices are adopted by holiday companies and their hotel suppliers. Call Simpson Millar’s Holiday Claims Team on 0808 145 1353 if you have been exposed to Salmonella – E coli – Cryptosporidium – Campylobacter or any other infection likely to cause sickness on holiday. Food Poisoning in Portugal – Are you Protected! Holidaymakers travelling to Portugal with tour operators such as Thomson – First Choice – Jet2Holidays, Thomas Cook etc. are often able to rely on powerful consumer protection regulation in the form of the 1992 Package Travel Regulations. If you are ill on holiday in Portugal, or if you develop gastric symptoms shortly after your return to the UK, then you can claim compensation. However, you will need to prove that your tour operator or its supplier was a fault and improperly performed the contract insofar as the provision of food or other services are concerned, and that this failure caused your illness. Simpson Millar’s experienced Travel Law Team has recovered vast amounts of compensation for sick holidaymakers who travelled to Portugal in recent years on package holidays. Hotel Watch – Travel Watchdog! Although many travellers to European holiday destinations such as Portugal expect to suffer from a short lived stomach bug, hygiene standards at Portuguese hotels have improved substantially thanks to European food regulations and investment in health and safety training by holiday companies such as Thomson and Thomas Cook. Health and safety initiatives from ABTA and their members has also raised standards in foreign hotels where UK tour operators can collectively influence the hotels management. However, Simpson Millar’s Travel Law team still receives a large number of enquires from travellers returning from Portugal. Holidaymakers are advised to review travel forums and Holiday Hotel Watch before booking their Summer vacation to Portugal. Most problems in Portugal seem to arise from bacterial and parasitic holiday bugs, and Cryptosporidium is quite common. If you have been diagnosed with food poisoning from E. coli, Salmonella or Campylobacter or a waterborne infection from Cryptospordium or Giardia Lamblia on holiday with Thomson in Portugal contact us immediately for advice. If you have been diagnosed with bacterial food poisoning or any one of the parasites listed above please call us for a free telephone consultation. If you experience food poisoning (Salmonella, E coli, Campylobacter etc.) whilst on a Jet2Holiday to Portugal please contact us immediately for advice. If you have been diagnosed with bacterial food poisoning or any one of the parasites listed above please call us immediately. UK tour operators sell holidays to the Algarve or the island garden, Madeira. Our Holiday Travel Law Team specialise in group actions involving food poisoning claims and illness in Portuguese Hotels. We regularly pursue claims as part of a class action. As a specialist travel law firm, we will be able to successfully claim compensation where high street practice will not. Our dedicated team of holiday claims lawyers are happy to speak to you about making a holiday claim. Call us now on 0808 145 1353 or complete one of our online holiday claims enquiry form to see if your claim is likely to be successful. Travellers who suffer from food poisoning and other gastric illness should be aware that claims must be made within 3 years of the onset of sickness. 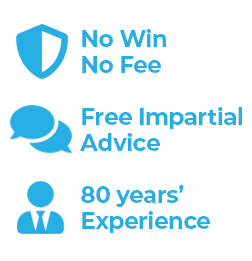 For more information, contact Simpson Millar today on 0808 145 1353 for further information on No Win No Fee funding.